I’ve been working my way around the diamond with rankings for both NL-Only Leagues and AL-Only Leagues. So far I’ve gone 25 deep at every position. That pretty much covers all the draftables players in a typical 11 or 12-team league. Moving to 75 deep for my NL-Only Outfield Rankings makes me realize how relatively cut and dried the infield positions were. Sure there are players others may disagreee on and there’s no doubt you’ll see some changes along the way this draft season. But, man, these outfield rankings have a lot of play. In the process of ranking them I have to put a number on them. The reality is that many of these players are valued so closely it comes down to category needs when you draft them. That’s why when I publish my overall rankings I’ll include dollar values. Even if your league uses a draft instead of an auction, the values give you a better idea of how close in value two players are. Four or five slots in the rankings could separate players values within a dollar or two. Balancing your team out is more important than that dollar you may or may not lose. I explain a lot more about how I do my rankings in my AL-Catcher Rankings article, but the main takeaway is that they are all based on the projections you see accomanying each player below. This way I don’t let my biases affect what is a mathematical process once the projections are in place. As I mention above, the outfield always forces me to look real hard at my projections. I don’t just move players around on my gut feeling. If something looks off, I’ll go back and look at the projections. If I’m still solid on those then I trust the math. But if I see something in the projections that needs tweaking, I do that and then re-rank to see where I’m at. All that is a long way of saying that my projections and rankings are never done until Opening Day. As involved as this process is Opening Day is a very happy day for me. While the NL outfield is deep in solid bats, Yelich and Acuna are the only two I consider truly elite; and even with that I expect a decent regression in home runs for Yelich. Yeah, the ballpark helps but he can’t possibly repeat what he did in the second half of 2018… can he? I will be targeting Rhys Hoskins in 2019. He had a nice 2018 season, but as an owner in a keeper league, he never quite got into an extended groove. I expect a small bump in homers and I think he can do better than .246. His 22.7 K% is not that bad and he’s got incredible plate coverage that should give him a chance to get that average in the .270’s. Right now I like the value Yasiel Puig offers. I can’t promise that value will still be there if the hype gets out of control with the change in ballparks. Right now he’s beeing drafted as the 34th outfielder in Fantrax mixed leagues, after players like David Peralta and Michael Conforto. I think his speed is unappreciated and puts him ahead of those two. 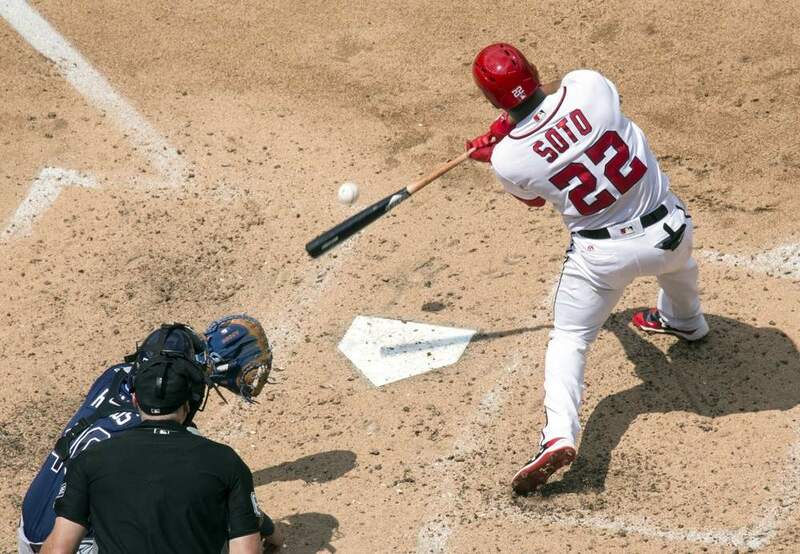 Juan Soto is another player I can’t see myself paying up for. He’s a great young hitter, but people are treating him like he has no faults. First of all, he doesn’t really run that well. It would be surprising to see him reach double digits. He also hit ‘just’ .286 in the second half. I’m not worried about his batting average, but it’s not a given that he will hit .300. He’s a very good hitter, but better in real baseball than in fantasy. You have to separate your feelings and value him for what he does. The rankings and projections below are based on the traditional 5X5 scoring categories and a 20-game eligibility requirement. If you like these NL-Only Outfield Rankings check out the rest of the 2019 FantraxHQ Fantasy Baseball Draft Kit. We’ll be adding more content from now right up until Opening Day! How is B Harper not on the OF list ??? This was completed before he signed Update coming over the next few days.